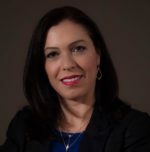 Susana provides administrative support to Partner, Adrienne Braumiller and other attorneys. Her responsibilities include answering the phone and directing calls as appropriate, making all travel arrangements, maintaining the surplus of marketing materials for conferences and BLG sponsored events, place order(s) for office supplies and other necessities when needed, assist with A/P reconciliation as well as offering her support to our Paralegal with filing deadlines to various governmental agencies when the need arises. She is the first one you see or speak with when a client visits and/or contacts our firm. Her compassion for others along with her professionalism make her an invaluable part of our team.